At Venue Hotel The Lily 新加坡八方酒店－百合, we provide six categories of room to suit the different needs of travellers. Relax in one of our new and well-designed rooms for an affordable and comfortable stay. All rooms come with complimentary wifi and local calls, a digital safe box, mini-fridge, coffee, mineral water, tea, hairdryer and cable TV. With its warm hues and view of the vibrant surrounding, the standard double room (no windows) is configured with a queen bed with pocketed spring mattress, laid with luxurious bed spreads. The standard twin room (no windows) is perfect for the hassle free travellers who want to spend the evening unwinding after a day of hard work and play. 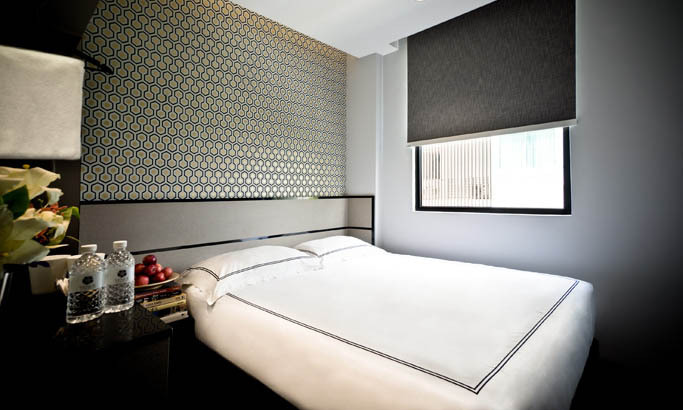 It comes with two single beds with pocketed spring mattress, laid with luxurious bed spreads. With its warm hues and view of the vibrant surrounding, the superior double room is configured with a queen bed with pocketed spring mattress, laid with luxurious bed spreads. The superior double room is perfect for the hassle free travellers who want to spend the evening unwinding after a day of fun and play. It comes with two single beds. The triple room is perfect for a small group of friends or family members travelling together. The spacious room is configured with one queen and one single bed, pocketed spring mattress, laid with luxurious bed spreads to rock you into deep slumber. Located on the highest level of the hotel, the spacious family room (no windows) caters to a small family with its two queen beds with pocketed spring mattress, laid with luxurious bed spreads.